The HSBC World Rugby Sevens Series is well underway, which means that the HSBC team is already hard at work activating the bank’s title partnership across owned, earned, paid and shared channels, with teams all over the world working hard to make each leg of the series a great success. With the first two legs of the series now in the books in Dubai and Cape Town, the series is a great example of how the work done by H+K is making a powerful impact across multiple channels. Alongside best in class earned media work, there has been impressive performance across HSBC Sport social channels, despite minimal investment in terms of hero content or paid support. In Dubai, this year’s tournament saw less activity that previous years in terms of hero content, due to various factors out of the control of the team. However, there was still huge success. There was still strong organic engagement on HSBC Sport channels with the two shots below receiving the most engagement across the weekend. Driven by excellent work by the Dubai H+K team, a strong suite of media coverage was generated: particularly with the objective for this year focusing on driving quality articles over quantity. There was an 8% increase in media value with 85% of articles containing key messaging (2017 saw 58% of articles containing key messaging) and 64% having a positive sentiment (2017 saw 11% of articles having a positive sentiment). There was local coverage from two radio stations, plus Men’s Health and the UAE’s no.1 newspaper, as well as global coverage in Ireland and the UK. HSBC ambassadors Bryan Habana, Brian O’Driscoll and Perry Baker joined and added value in authenticating key HSBC messaging as well as driving competition interest over the weekend. Habana and BOD tackled a challenge to catch and hold as many rugby balls as possible. This is a simple ‘competition’ of sorts running across all the legs and creates natural, lighthearted content to live on their channels. 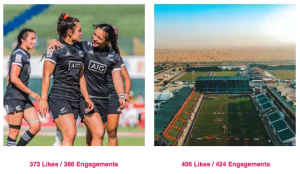 Cape Town saw great social engagement with 6 of the top 10 performing images all time on HSBC_ Sport Instagram coming from CT 2019 including the best performing image in the HSBC Sport Instagram account’s history reaching 2,091 likes. The team made an effort to find new audiences on Instagram, using popular #s that would put the content on people’s feeds, resulting in 667 new followers since the tournament weekend. HSBC were joined by ambassadors Cecil Afrika, Seabelo Senatla, Mirithy Pienaar and Bob Skinstad who authenticated HSBC’s key messaging and were active on their social media. 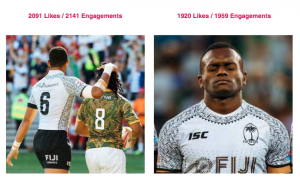 Seabelo Senatla took part in the catch challenge which Habana and BOD attempted in Dubai and it resulted in organic engagement from Senatla’s channels: again increasing the presence of HSBC.